He explains his decision of incorporting the analysis to control "a future drift in the implant quality". "When we subcontract this test in a Laboratory, a simple trial report is not enough". "It is only with such a level of trial report that we can hope to win the trust of an auditor of CE or FDA marking". Please, consult us for other standards. To read the full testimony, please click here. Luc Martel, Professor of Chemistry in PC*, at "Lycée du Parc" in Lyon uses the potentiostat / Galvanostat / impedancemeter OrigaStat - OGS100 in compliance with the programs of scientific preparatory classes. 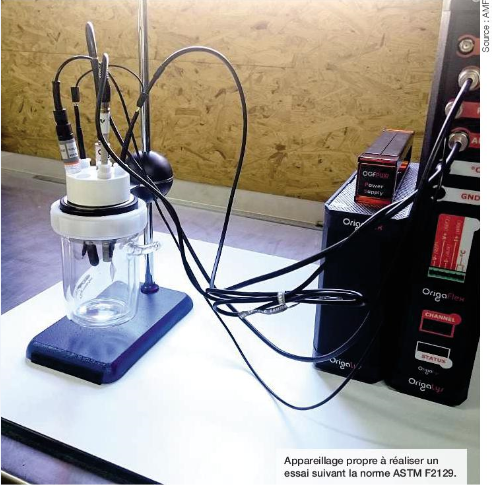 This scientific tool allows professors from different fields: MP, PC, PSI, PT and TPC to carry out demonstration projects and creates a better understanding of electrochemical measurement. Detection of Slow-Fast system (voltammetry or chronopotentiometry/amperometry), observation of diffusion limited current (influence of concentration in a solution, linear voltammetry, use of Rotating Electrode) and studies of wet corrosion (Flade and EVANS Potential) are made in Preparatory classes. Electrochemistry is growing every day, thanks to its huge range of applications in the Industry. That's way, new Practical Works will be created for September 2014. It will be based on Battery methods, mainly on Fuel Cells (Cahrge and Discharge). The Lycée du Parc has two devices potentiostat/galvanostat/Impédancemètre OrigaStat - OGS100. In order to allows the students to work on that methods, more devices have to be purchased. First time I heard about OrigaLys, it was during our collaboration with the Ecole Normale Supérieure (ENS Lyon). OrigaLys has fixed their Radiometer’s instrument. After analysing the whole product range on the OrigaLys website www.origalys.com, the OrigaStat OGS080 seemed the most suitable device for our teaching purposes, especially because of the software intuitive programming (flowchart). Indeed, it was one of the most important criteria to select OrigaLys instruments. Its evolutionary capacities, such as battery methods implementation, makes the OrigaStat the perfect instrument for preparatory classes for PC*. Thus, we would be able to have great and various methods for teaching.